Remington has a great line of personal grooming products, with something to keep every part of the body looking great. The Remington NE3250 Nose, Ear, and Brow Trimmer looks a lot like an electric toothbrush, but actually has a trimmer comb at the end. It’s cordless and battery operated. 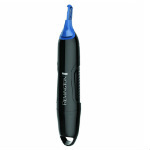 The Remington NE3250 trimmer comes in an elongated black plastic body with a blue end where the trimmer comb is located. 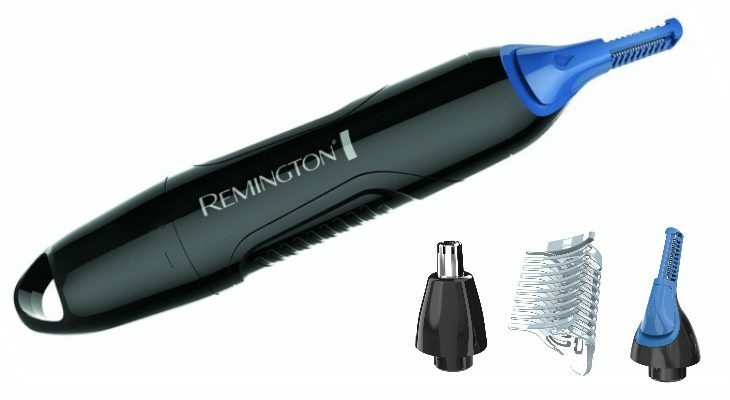 The Remington logo is located vertically on the front of the trimmer, and there is a loop at the bottom so you can hang it up on a hook. 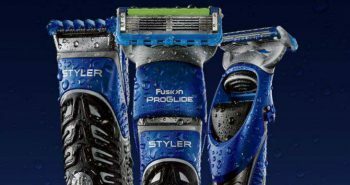 This will help to keep your trimmer from getting damaged in the shower or on the bathroom counter. The Remington NE3250 has small indentations on the side, so that you can easily grip it in your hands. There are three different attachments to use. 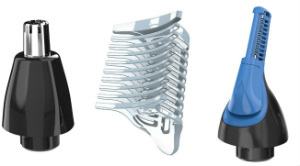 One is the clear plastic eyebrow comb, so you can shave your eyebrows or other regions of your face. This comb is perfect for getting the right length and shape of your eyebrows, so you never cut them too short. There is the rotary nose and ear cone to trim hair from nose and ears. 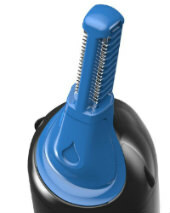 The small blue trimming comb has two trimming heads on either side, so you can use it to remove smaller hairs from around your face and do more accurate trimming. 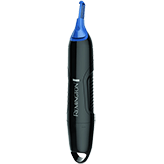 The Remington NE3250 Nose, Ear, and Brow Trimmer is designed with Comfort-trim technology, so you’ll be able to easily and more effectively trim hair from the smallest regions of your head. The Remington NE3250 trimmer can also be used wet or dry, so you can take it into the bath or shower in the morning, and get a more comfortable shave when you use it with warm water. It’s also easily washable, so you can get the fine strands of hair out of your trimmer, so it stays in optimum running order. They call this the wash out system, so that you can rinse it out in the shower or in the sink. T here is no power on switch to turn this on. 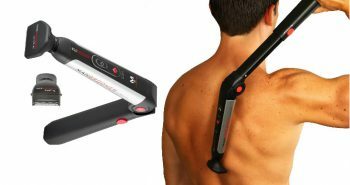 To activate it, you twist the bottom portion of the shaver to turn it on, and back again to turn it off. If you twist it too far, you’ll pop open the battery compartment where you change the batteries. The Remington NE3250 Nose, Ear, and Brow Trimmer costs under $12, making it extremely affordable, so you don’t really need to make any decision at all. It measures 1.2” x 7” x 2.6 inches and weighs 4 ounces. It takes one AA battery. If you’re seeking an inexpensive trimmer, then the Remington NE3250 Nose, Ear, and Brow Trimmer may be right for you. But if you really want one that’s cordless and rechargeable, rather than having to replace a battery every few weeks, you may wish to examine one of the more expensive Remington products. It’s also a great option to take on trips as you won’t have to worry about universal voltage or compatible plugs.